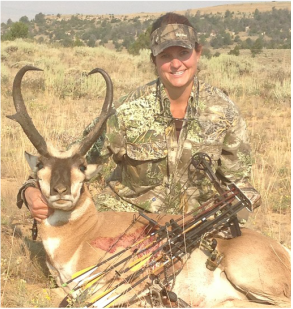 Antelope hunting in Wyoming is an exciting and yet highly successful experience for every hunter from the beginner to the pro. The antelope are plentiful which provides a great opportunity for most everyone to harvest an animal. Don't let the over abundance of antelope in our state fool you into thinking this hunt is too easy...Antelope are a wily, sharp sensed, fast moving animal which provides an exciting challenge. We offer rifle and archery hunts for antelope. The hunts can easily be paired as a combination hunt with mule deer or elk. If you harvest early you may also have the opportunity to visit a nearby prairie dog town to do some shooting. This very large ranch in the eastern part of the state is an antelope hunters paradise. The nearly 40K acres accommodates two antelope areas, area 6 and area 7. Bucks range in the mid to upper 70's. Last years big buck scored 83". We operate archery and rifle hunts on this ranch. This hunt is a town hunt, so lodging and meals are not included in the price. However, we work closely with the Flying V Lodge and they offer superior service at a very fair all-inclusive price. There is a meat processor on site at the Flying V Lodge as well. Check out their website below for more information. In the special draw no points are needed for either area. In the full price draw 1 point is needed. We boast a near perfect success on antelope hunts in this area. Ask us about doe hunts. This hunt can easily be combined with the Bowman Mule Deer hunt. This lease is located outside of Torrington, Wyoming. The ranch is 10 thousand acres and offers some very fine antelope hunting. Irrigated hay fields along with corn fields on the ranch and surrounding areas keep them coming. Bucks will range between 70-80. This hunt is conducted from a camp where accommodations are a ranch house with modern day facilities. All meals are also provided. In the special draw no points are needed. In the full price draw 1 point will draw a tag. The season dates are September 20th-October 15th. This hunt can be conducted as either a town hunt or bunkhouse hunt. This is an archery only area near Greybull, Wyoming. It's a 3 day hunt on BLM land which means literally thousands of acres to hunt. It can easily be combined with an archery mule deer or archery elk hunt as well. Pope and Young class bucks are common place in this area and you can expect a great hunt with the spot and stalk method using decoys and known feeding areas and watering holes. In this area we are permitted for a private ranch of about 10,000 acres. This hunt can easily be combined with a trophy whitetail deer hunt. Opportunity on bucks in the upper 70's are possible. We only take 5 antelope off this ranch each year to be able to continue to offer very high quality hunts. This area takes 1 point in the special draw and 3 points in the full price draw. We offer this hunt as either a cabin hunt where all accommodations are provided, or as a town hunt where you are responsible for your own lodging and meals.